On January 1, the Washington Post published its exposé into the ongoing trade in tiger bone wine at the Xiongsen tiger ‘farm’ in China. With the crisis facing elephants and rhinos, it is a timely reminder to the international community not to forget the tiger, especially in the lead up to a high-level international meeting in Botswana in March 2015, a follow-up to the London Conference on Illegal Wildlife Trade hosted by the UK in February 2014. Despite signing up to the February 2014 London Declaration on Illegal Wildlife Trade, the Government of China maintains policies that actively encourage the use of tiger and other big cat parts rather than eliminate demand. Chinese policy has facilitated a licensed trade in the skins of captive-bred, or ‘farmed’ tigers, perpetuating the desirability of tiger skin rugs as lavish home décor for the rich and powerful. This runs completely counter to a UN decision in 2007 that tigers should not be bred for trade in their parts and products, including domestic trade. With costs running high, buyers continue to turn to illegally acquired tiger, leopard and snow leopard skins as a cheaper alternative, stimulating the poaching of wild tigers and other Asian big cats in neighbouring countries. EIA and our partner the Wildlife Protection Society Of India (WPSI) have documented this illegal trade for years and more recently EIA has investigated how China’s experiment with trade in farmed tiger skins has stimulated demand by promoting a luxury and unnecessary market (for more detail, read the EIA reports Hidden in Plain Sight and Caged Assets). The overly tentative approach of the international community to press for implementation of the 2007 decision has led to a mushrooming of tiger ‘farms’, not just in China but throughout South-East Asia. 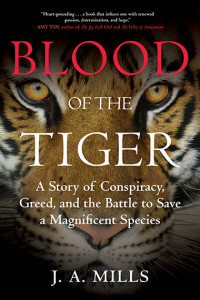 Much of what has come to pass is reflected in a new book released today by Judy Mills – Blood of the Tiger is the author’s personal account of the battle to save the tiger from being reduced to a domesticated agribusiness commodity. EIA campaigners, past and present, have worked alongside Judy during her tenure in various conservation organisations and as the coordinator of the International Tiger Coalition, which at one point represented 40 conservation organisations united in their goal to end tiger farming. Her passion, commitment, knowledge and neutrality enabled her bring together a powerful lobby of concerned government, non-government and civil society representatives that led to the UN decision in 2007. Judy created a space and a platform for everyone’s voice to be heard, for every organisation no matter how big or small, to feel they were really part of a single movement with no role for organisational or individual ego. That takes great grace and patience and I believe it was Judy’s humility that secured the success of the International Tiger Coalition. Blood of the Tiger is Judy’s memoir, her trials and tribulations, her story of friends and foes along the tiger conservation journey. She writes of her comrades and heroes, but she should not forget that she in turn is an inspiration and a role model to many of us in this field. Published in the US, you can buy a copy here. If you’re in the UK, it will also be available via Amazon from February 6 here.